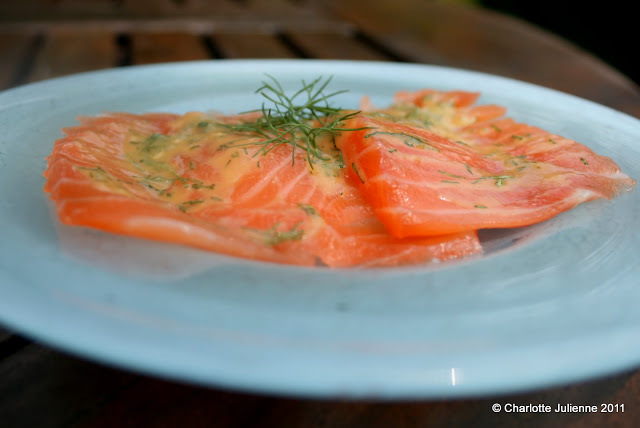 Gravlax is a Scandinavian term for buried salmon. Fishermen used to salt the salmon and bury it in the sand above the high-tide line. We “buried” ours in a curing mixture and left it in the fridge for a few days. We began by purchasing a large piece of salmon which we halved for two different recipes. We scored the top with long diagonal slices. We made a mixture of white and brown sugar, salt, peppercorns, fennel seed and coriander seed. We mixed this together and then spooned it out to cover the bottom of a glass baking dish. We gently laid the salmon on top of the mixture. The salmon was then covered with the remaining curing mixture. We poured Ouzo over the top and then pressed it all down into the salmon. We needed to press this mixture down into the salmon so we wrapped the first layer (the salmon layer) in saran wrap and then placed an additional baking dish on top which we filled with heavy items we already had in our fridge. We pressed this for 24 hours and then rinsed it and allowed it to dry in the fridge for a day or two. We served this on its own on a chilled glass dish. To the top we added a mixture of fresh dill, Dijon mustard and honey. It had such a light flavor and was a nice change to the smokiness that usually accompanies salmon.